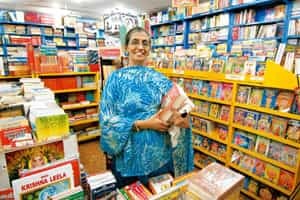 Mumbai: In the basement shop of Giri Trading Agency in Mumbai, Usha Sreedharan and her husband happily trawled through hundreds of religious, spiritual and self-help books, compact discs (CDs) and curios before emerging with the music they wanted. They picked up CDs of a Carnatic music recital, the Gayatri Mantra and the Rudri chant and other Hindu hymns. “My husband is the managing director of the Bank of Baroda in Ghana and is posted there for two years. He wanted to buy some music that will help him feel at home while he is there. So, of course, we came here," Sreedharan said. The Sreedharans, regular customers of Giri Trading for almost a decade, cannot stop gushing about how much they like its concept of organized religious retail. “They have such a lovely collection. Any book, any music, any idols, we don’t need to go all the way to Chennai. We get it right here in Mumbai. They even get idols sculpted for you from Chennai artisans." Giri Trading Agency Pvt. 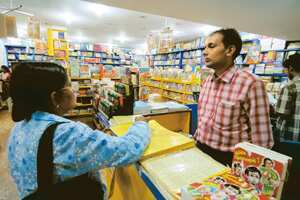 Ltd, which started off with an investment of Rs300 and is now a Rs20 crore enterprise, is probably the only retail chain for religious products ranging from books and music to idols and pooja clothes. But few outside Giri’s devoted clientele have heard of the company. Academic experts studying brand and retail marketing say they have never heard of Giri Trading. The concept is unusual, says Mini Mathur, assistant professor in retail management at the Mudra Institute of Communications. Mathur, who is also a part of the faculty development programme at the Indian Institute of Management, Ahmedabad, says she knows of retail franchises such as yoga guru Baba Ramdev’s or the chain run by the Bramhakumaris, a religious organization. “But this concept of bringing them all under one roof in a chain of retail stores is very unusual." “We wanted to create a place where you would find all of these religious products of all religious groups. The bottom line was—if a customer might want it, we should have it," says Iyer, who runs its operations and is a part of the team spearheading its expansion plans. “We did not ever market ourselves before. But we are ready now," she says, explaining that her family is very keen on taking her father’s legacy to the next level of religious retailing. She remembers her father as a devout man. “He worked for an international paper company and was respected within the firm, but his heart was not in it. His first calling was always religious events. He would just leave work and go to attend shivirs (religious camps) and ceremonies. When they warned him at work about it, he said ‘god is my first job, so if you want to fire me, that is okay’," Sharda Iyer recounts. “Of course, they never fired him." Giri stayed with that firm until he decided to quit and set up a shop of religious books. “It’s a funny story. He was invited for the thread ceremony (a sacred thread given to the sons of Brahmins) of his friend’s son. He wanted to gift that child a mantra specially written by ancient saints for that occasion, but he could not find it anywhere in Mumbai. So, he took leave from work, took a train to Kerala, went there and bought it. But before giving it away, he quit his job, made several hundred photocopies and set up his shop with them," says Sharda Iyer. In May 1954, with a wife and nine children, Giri resigned from his job, gave up the company bungalow in Chembur, a Mumbai suburb, borrowed Rs300 and set up the first Giri trading shop in the loft of another shop. Fifty-five years later, the enterprise has grown into a company with a presence in major cities of south India and hundreds of tie-ups with religious groups, publishers, music companies and artisans across the country. V. Subramaniam, the general manager, says the number of branches has been growing rapidly in the last decade and the company is identifying locations in north India with a significant presence of south Indians to open more shops. “We have a process of survey and shall move forward on getting the right answers for our questions and with basic entrepreneurial attitude. We are looking for private equity to fund our expansion programmes." Building the company has taken a long time. As children, Sharda Iyer and her siblings spent most of their afternoons hanging around a street corner in Sion, a middle-class neighbourhood in central Mumbai, running errands, selling religious books and curios in their father’s shop. “We would come back from school, straight to this corner. Our father would leave us to look after the customers until he returned in the evening. It was almost like child labour, but we never felt it because we were having so much fun and we were doing God’s work. We learned customer service here and we helped build this company from ground up." The flagship of Giri Trading was a streetside betel nut and cigarette shop converted into a religious books and curio market. The shop still stands at the same corner, but over the past half century, the street around has changed. The old Irani restaurant that once stood behind their little shop has become a part of the company. “I remember that old uncle who used to run that restaurant. He was very old, but still had to support his children. Seeing all of us, so young, helping our father run his business, he had a soft corner for us. So, when he retired in 1989, he made us the first offer," recalls Sharda Iyer. That year became a defining year. “Until then, we were only running a small shop that my father really loved," said Kashi Vishwanath, one of the founder’s six sons, who now oversees the Mumbai operations with his sister. “This was our chance to grow." But the decision was not easy. The restaurant would cost Rs25 lakh, a vast sum in those days and it was an “amount that we had never seen". The only way to buy it was to get a bank loan, a tedious process in the days when credit was difficult to access. Janardhan Iyer continues to be the family’s accountant today and says he remembers putting the papers together for them. “Those days, banks were very tough. If all your papers were not seamless, they would not even look at you. So, I prepared all the papers for them and somehow, the bank agreed to give them the loan. It was a holiday in Mumbai when the loan was approved. So, we flew to Chennai to pick up the money in a suitcase. It makes me think of the Hindi movies. All of us, sitting in a plane with a suitcase that had more money in it than we had ever seen," says Sharda Iyer. In the meantime, their Chennai operations continued to grow. “My father had bought our Chennai shop in 1976 and my mother moved there with three of the youngest siblings. One of them went to a Sanskrit school and turned out to be a fantastic singer. He began to record hymns and shlokas that were very popular," Sharda Iyer said. So, it was no surprise when their youngest sibling, T.S. Ranganathan, led the company into music. “I used to sing at our shop inside Kapaleeshwar temple in Chennai at first. Then, I sang on All India Radio," Ranganathan says. “So, naturally, my family thought it was a good idea for me to record for the business. The first recording, a Shiva stuti was released on Shivratri day and sold about 50,000 copies. It was fantastic." Ranganathan then set up his own studio in Chennai—Surang—where he recorded his CDs at first. “Now it has become a mainstream advertising studio for south Indian channels. About 30-40% of advertisements shown on south Indian television are made in our studio." Now, the family is planning its next steps. In the south, Ranganathan plans to take the company’s music business mainstream. “We have launched India’s first music kiosks, where consumers can choose music tracks of 60-70 music companies, create their own CDs and use. We are in talks with some other retailers who would like us to set up kiosks in their stores…lets see how that goes." In Mumbai, they meet regularly to strategize the expansion. “We want to set up a chain of 50 stores in the next two-three years," said Sharda Iyer. “Until now, we ran this like a family business. Now we plan to hire trained people and get some funding for our plans." Subramanian, who has been the general manager of the company for the last decade and overseen most of its expansion, says as incomes rise, “people have started allocating some budget for religious purchases such as buying stotra books, devotional music," and in the process the idea and market positioning of Giri Trading has changed. “Earlier we were known for selling religious stotra books and now we are a brand—Giri—identified with Indian culture and tradition." Stotras are Hindu chants of praise. Ranganathan adds that while there are Web portals trying to sell similar religious products, the company has a long history that gives it a lot of credibility in the market. “We are not a fly-by-night operation. It has taken us many years to comprehend this market and consumers understand our service ethic. We are looking at expanding, but spiritualism is not the place where you say he made more money than me. We don’t sell something just for the sake of selling. We are serving god here."